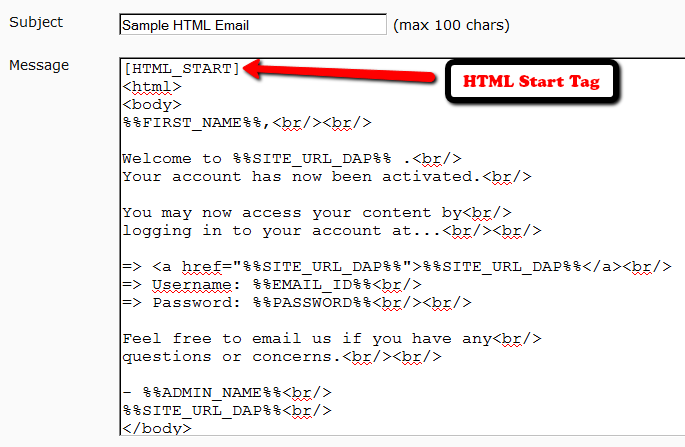 DAP can send out “Multi-part” emails – that is, emails that have both a “text” portion, and an “HTML” portion. If there are any email clients out there that cannot handle HTML email (in the year 2010, there are really no such clients, really), then the “text” portion of the same email will be shown to the recipient. To send out HTML emails, it is very important that you insert the HTML Email Start Tag – [HTML_START] – into the body of your email before you insert any HTML tags. The same goes for any email that you want to send out in HTML format: Just before you insert your HTML code, just be sure to insert the HTML Email Start Tag [HTML_START]. And the HTML you insert should be full-blown HTML, starting with the <html><body>…. and ending with </html></body> tags. NOTE: DAP does not have a built-in editor to create the HTML yet. So you will have to create the HTML code outside of DAP – either using a HTML editor like Dreamweaver, or you could even compose a draft page in WordPress, and use that as the source of your HTML code that you would then use within DAP to send out HTML email.